(Bloomberg) -- Japanese online brokerage Monex Group Inc. is counting on its recently acquired cryptocurrency exchange to help its securities arm recover ground lost to bigger rivals. The firm’s brokerage unit is considering adding digital currencies to its offerings for retail clients in collaboration with sister company Coincheck Inc., which won an exchange license in January, said Yuko Seimei, Monex Securities Inc.’s new president. “We’ve fallen a little behind -- we can’t deny that,” said Seimei, 41, referring to an increase in market share of competitors including SBI Holdings Inc. and internet retailer Rakuten Inc. “If we keep doing things the way we have, we may not be able to close the gap,” she said in an interview. Seimei’s revival plan faces hurdles, as individual investors remain wary of stocks after last year’s global rout and volatile digital currencies trade well below the heights of 2017’s frenzy. Still, Japan is among the world’s most active crypto trading markets and the nation’s regulator has been more willing than some to accommodate the industry despite a series of hacks, including at Coincheck. Monex, established in 1999, used to be Japan’s largest online brokerage. SBI and Rakuten are solidifying their lead over the firm, which handled only the fifth-highest amount of online trades by individuals in the nine months ended December, according to SBI data. Competition is intensifying as Nomura Holdings Inc., Japan’s largest securities firm, prepares to launch an online brokerage with messaging platform Line Corp.
Making the most of their various business lines is one reason why SBI and Rakuten have attracted new customers, said Seimei, who joined Monex in 2009 after stints at a private equity fund and a Japanese commercial bank. 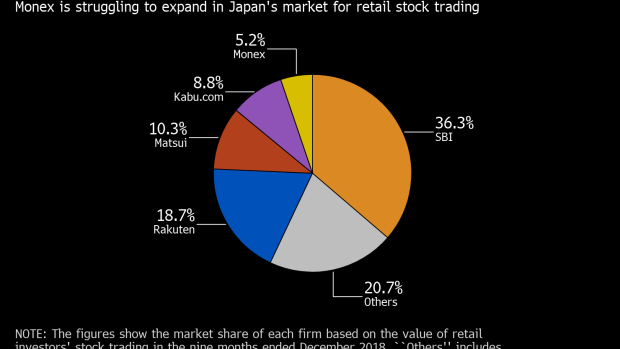 Rakuten’s brokerage, for example, allows consumers to use points awarded through purchases at the group’s internet shopping sites to invest in stocks. Monex purchased Coincheck last year, helping the cryptocurrency exchange regroup after it lost around $500 million of digital assets to hackers in January 2018 in one of the industry’s biggest heists. In the months after the acquisition, Monex focused on getting Coincheck’s license from the Financial Services Agency. Seimei, the first woman to head a major online brokerage in Japan, said she doesn’t think her gender disadvantaged her in the country’s male-dominant society.